Most people don’t have a networking plan, even though part of the difficulty with networking is that it can get pushed off your priority list if you don’t make time for it. You can easily spend hours and hours finding and meeting new people. But, if you don’t stay in touch with them or don’t do anything with what you learn, it’s all a waste of time. That is why we recommend you put together a networking plan, so you know what you need to do every day to reach your networking and career goals – whether that is finding your dream job or getting that dream promotion. Note: If you want to save time, click here to download the networking action plan now. Here is an effective networking plan that will take you no longer than 20 minutes each day. Did you know that you are 95% more likely to achieve your goal if it is written down? If you go through the next 30 days with no clear goal in mind, you won’t be able to achieve anything. Day 2: Create a networking action plan. This month, each person that you talk to and each event you attend should be targeted. Ask yourself these questions. What is my specific career focus? In the next three years, what is my short-term career goal? In the next 5-10 years, what is my long-term career goal? What is currently working in my network? What is currently not working in my network? Where am I overinvested and underinvested in my current network? Given my career goals, what kinds of people should be in my network? Don’t do this alone. You need a community. Tell someone you know and trust so that they can hold you accountable to your networking plan. If you need a community, join our Love Your Work and Life Ladies Facebook group. Day 4: Find people for informational interviews. Find people in your network that you want to learn more about. They may not have your dream job but could refer you to someone else who does. Follow up with people you met in the past at professional association meetings, classes, and previous jobs. Get referrals from friends, family or contacts you can identify online. Day 5: Block off time in your calendar each week to network. Set up certain times each week that you are free to meet with people in your network. For example, every Wednesday at lunch or every Monday after work. Day 6: Make a list of people you have lost touch with. Sometimes it feels like there is not enough time in a day to stay involved in the lives of our family and friends. Make a list today of all the friends and family members that you would like to catch up with. Day 7: Make a 2X2 list (or a 4X4 list if you are very determined!) and contact these people. Make a networking plan to meet with two people that you already know and two people that you don’t know. Call or email these people to see if they would be interested in meeting with you over the next few weeks. Remember that you don’t have to meet these people in person, you can always practice your interview skills over the phone. Day 8: Do research on the people you don’t know. To make sure that you make a great impression and get the most out of the informational interviews, make sure you research their industry, their company, and their background. Linkedin and Google are very useful tools for this. Remember, the goal of this meeting is to get a referral to speak with someone else, so you must be as knowledgeable as possible and put your best foot forward even though this isn’t a real job interview. You never know who they might know and be able to refer you to! Day 9: Write out the questions you will ask during the informational interviews. After doing research about who you will be meeting with, make a list of all the questions you would like to ask them. Some great questions are: What is your typical day like? How did you get your job and how do you recommend someone like me get into your field? How is the economy affecting your industry? What do you like most about the company you work for? Do you know of other people who I might talk to who have similar jobs? Save a document with these questions online so that you always have it handy to reference or print. Day 10: Review your interview outfits. Do you have a comfortable interview outfit that you feel confident in? Try on what you plan to wear to the informational interview and look at yourself in the mirror. Do you look professional? Do you feel comfortable? If not, spend some time today at the mall so that you can make sure you will be comfortable. You will be going on many interviews soon and you want to make sure you don’t have to stress about what to wear. Day 11: Research professional organizations and sign up for one this month. Do some research online to find the best professional organization in your area for your industry. Go to a meeting this month and find someone at the meeting that you enjoy talking to. Follow up with this person and do an informational interview after the event. Many organizations have discounts for new members and students, make sure you check into it. Day 12: Go out to lunch with a co-worker, classmate, or friend you don’t know very well. Never forget the people that are right in front of you every day! Sometimes we get so busy with our work that we don’t have time to make great relationships with the people we spend 40+ hours a week with. Ask a co-worker to lunch and learn more about them. Day 13: Call a family member you haven’t spoken to in awhile. When was the last time that you spoke to your great Aunt Gladys or your Grandpa Harry? Day 14: Follow companies you are interested in on LinkedIn and see how you are connected with employees. Find your favorite companies and stay connected! You may notice that you LinkedIn network includes people who work at your favorite company. Email them and ask them for an informational interview. Day 15: Update your LinkedIn page and ask for recommendations. Do some work today to clean up your LinkedIn profile. Add a professional photo and ask people you trust to write a recommendation for you. Find people who want to help you succeed. Day 16: Write in your journal about what you have learned so far. Review your goals from the beginning of the challenge and see how you are doing. Do you need to meet with more people in the next 15 days or can you pat yourself on the back and relax? Day 17: Go back to your college and find alumni contacts. Stop by your college or call your college career center to find out where you can find a list of alumni contact information that you can set up informational interviews with. People always want to help others that they have something in common with. Day 18: Try a new social activity. Join a sports team after work or take up a new hobby where you get to meet other people or attend a new church. Whatever you do, make new connections! Day 19: Plan ahead for your 4 X 4 for next month. 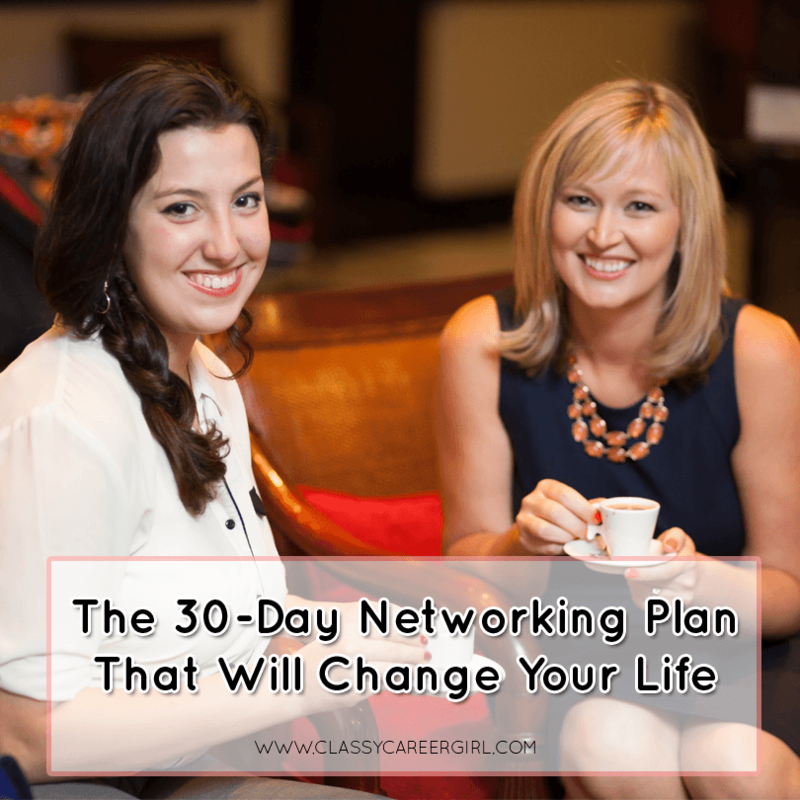 The secret to succeeding in this networking plan is planning AHEAD of time. If you plan out NOW who you are going to meet with next month, you will easily meet with eight people and enjoy it because you won’t be stressed. So take out that journal, make a plan, and start emailing your growing network! Day 20: Check back in with the person who is holding you accountable and review your goals. Seek advice and be honest! Let them know how you are doing with your networking plan and what you need help with. Day 21: Make a master list of all of your contacts. This way you will be ready to send out Christmas, birthday, thank you, or job search update emails to your network to stay in touch. Put reminders on your calendar every month to make sure you stay on top of birthdays and other important events. Remember the power of handwritten cards! Day 22: Send thank you letters. Follow up with everyone that you have met so far and thank them. Also, thank all of the people who have opened up their networks and connected you with their friends and co-workers. Be generous and let them know how they helped you! Day 23: Let your friends and family know your goals. Now that you have spoken to a few people, your dreams and goals should be getting clearer. If this is the case and you now know more of what job or industry you want to be in, tell your friends and family. It is amazing how once you start telling people what you want to do, doors start opening. It is sometimes a leap of faith, but it is worth it to have the support of your friends and family. Day 24: Ask to have a meeting with your boss. If you don’t have one, have a mock meeting. It is sometimes hard to have a comfortable dialogue with your boss because you are nervous. Today, initiate a meeting with your boss by asking him/her to lunch or coffee or showing him/her a project that you have been working on. Better yet, tell them about an idea you have that could increase sales or efficiencies. Your boss will appreciate it. If you don’t have a boss right now, ask a friend to pretend to be your boss and do a mock meeting instead. Day 25: Review your resume and make changes based on conversations you have had this month. Is there a skill that employers are looking for in the industry you want to get in that you have? Make sure you highlight in on your resume. If you have no changes, try sending your resume to someone you met this past month and ask them for feedback. Day 26: Stay in touch with LinkedIn. Send LinkedIn requests to people you met this week. Go through LinkedIn today and try to connect with as many people that you can that you know. LinkedIn can tell you people you may know by going through your address book or you can search names of people that you would like to stay in touch with. Day 27: Go to the library or bookstore and buy a book about networking. My recommendations are Never Eat Alone by Keith Ferrazzi, The Fine Art of Small Talk by Debra Fine or How to Win Friends and Influence People by Dale Carnegie. Day 28: Wake up 15-20 minutes earlier. You might not think today’s task has anything to do with a networking plan, but it does! One of the biggest excuses that people use for not networking is that they don’t have time. Use this extra time in the morning to reconnect with people and stay in touch by sending a quick email or writing a birthday card. Day 29: Create a binder or folder on your computer with all of your networking documents and emails. Include your interview questions, contact information, things you learned about each person you interviewed, follow up steps that you need to take in your career, and contact information for referrals. Set reminders on your calendar, too. Include the purpose of the meeting, target company list, how they can help you, ideas, and follow up steps. Day 30: Write down what you learned this month in your journal and CELEBRATE. Re-evaluate your networking plan goals and if you want to go a different direction next month. Don’t forget to ask a friend or family member to help you celebrate for a job well done! CONGRATS on completing your first month of the networking challenge. Let us know in the comments below how your networking plan is working!